Mental Health Nursing wants to promote an exchange of ideas and showcase fresh and innovative practice. The aim of this guide is to help authors maximise their chances of being published, and to avoid common mistakes. The editor is always willing to provide advice and guidance and you are strongly urged to contact him before you start writing your article. It is important that you write carefully and accurately, ruthlessly removing superfluous or ambiguous words. Please check your spelling, especially unusual or scientific terms or names. Start with a single sheet of paper outlining the order of your ideas and arguments. Before you start to write, read some articles in respected journals, which you consider to be especially well written. 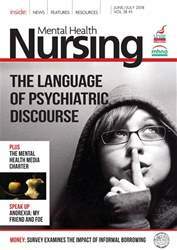 • Is my paper mental health nurse/nursing centred?